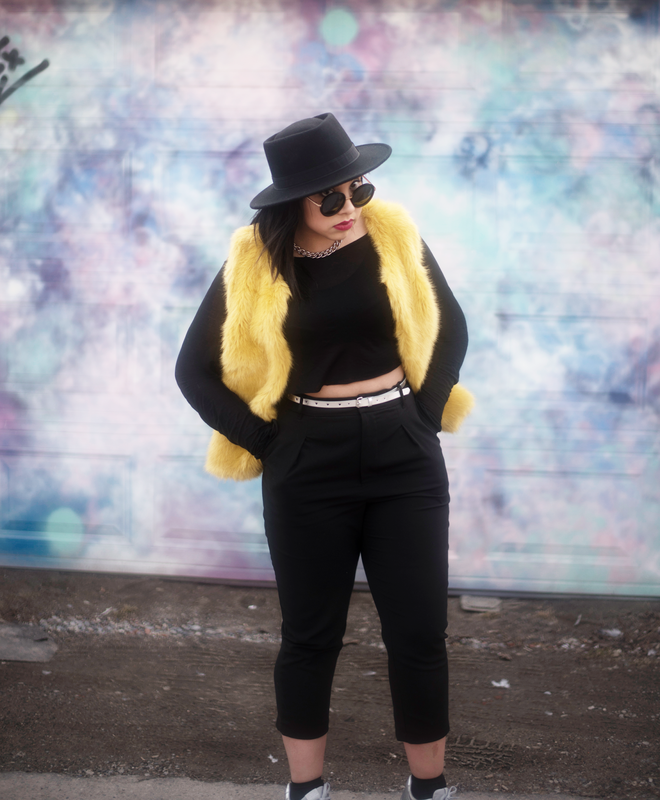 Faux fur season is reaching a close so I thought I would squeeze in one last wear of my bright yellow, Big Bird-esque, faux fur vest from Topshop. With this vest, it was love at first sight. I spotted it around the Christmas Holidays and had to hold off on swiping that card because I had a long list of gifts to buy for my loved ones. Luckily I scored a gift card and made Topshop my first stop (obviously) where my dream vest patiently awaited me and also happened to be on sale. Don't you love it when that happens? The easiest way to wear an in-your-face statement piece like this is by keeping the rest of the look pretty minimal. Although there is a time and place to go all out, (ie. I wore gold palazzo pants and a white shearling coat to the Rudsak show at Toronto Fashion Week this season, YOLO) an outfit like this always comes across as somewhat effortless. I decided to do silver accessories with this look as I felt gold would be a bit too much yellow in one sitting. Remember Bumblebee from Transformers? I'm thinking of this as a sort of Bumblebee chic, no? More photos and outfit details after the jump!